A Good Coffee Drinker's Guide .. Craft Coffee: A Manual Intervi.. 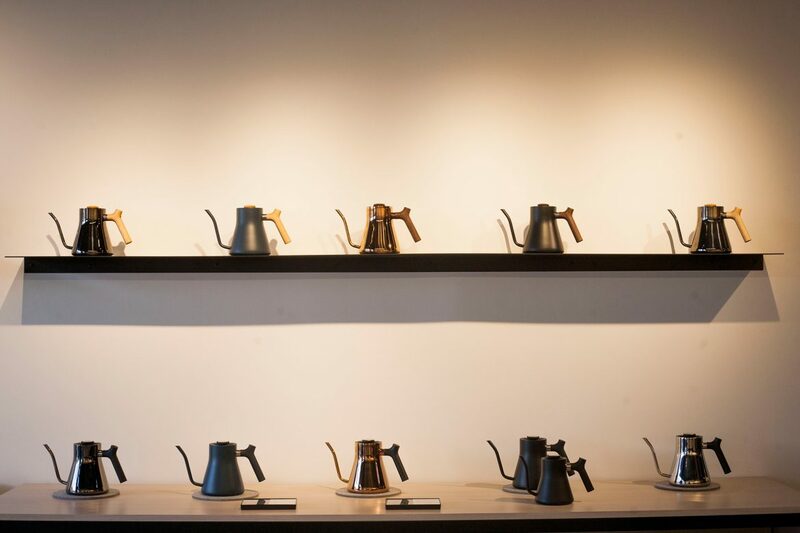 If you were walking along the increasingly gleaming corridor of Valencia Street in San Francisco’s Mission District, you might find it odd to saunter past Fellow and it’s assortment of high-end kettles and other beautifully designed coffee knick-knacks. Owner Jake Miller and Brand Manager Hanna McPhee know this to be true, they’ve heard the customers outside. “It’s my favorite thing,” McPhee says, “walking by and listening to people talk. ‘These guys are going to go bankrupt. '” And in an increasingly gentrifying neighborhood, one where a Reformation sits within walking distance of three ice cream shops, the talk has some weight. Or it would, if just kettles and coffee appliances were all Miller and McPhee were looking to sell. It isn’t though. Fellow seeks to provide not only a coffee brewing experience but education for the laymen and expert alike. Miller caught the coffee bug at Caribou Coffee in the Midwest, and having always known he wanted to start a product company, he moved to the West Coast to get his MBA at Stanford. Fellow’s first product—the Duo Coffee Steeper, a stylish “gunk-free” twist on a classic French Press—was born as a class project at Stanford’s vaunted D-School, before Miller got its production budget funded on Kickstarter. With Duo in hand, Fellow was born. Hanna McPhee, a graduate of Brown/RISD who’d majored in bio-design, was the second employee. The idea behind Fellow’s original line was to design products that were beautiful—and they are—but also functional, for both coffee novices and competitive baristas alike. “Coffee can be pretentious,” Miller says. “We want to be the approachable friend in our customer’s pursuit of great coffee.” All Fellow’s products, from the Prismo AeroPress attachment to the ultra-popular electronic Stagg EKG kettle, are concepted, prototyped, and tested over and over again as Miller and team search for the “beautifully functional” sweet spot between design and use. The idea behind a brick-and-mortar space grew out of Miller’s long burning want of a space where customers could not only experience Fellow’s product but receive an education in how to use them to make amazing coffee. Behind the product showroom is what Miller and McPhee have dubbed the Playground, a space where customers can purchase a single test tube of one of Fellow’s featured beans, and with the help of brew guides, learn how best to grind and prepare them using the company’s products. With most of their sales still coming from online, Miller sees the store as something else. The Valencia space—the first of many they hope—also acts as a product testing ground, a place where Miller and McPhee can receive direct feedback from the people who are buying and using their products. “We’re reducing the distance between us and the customers to zero,” Miller says. “We take feedback, good and bad, and it influences our future product design.” Every product begins by having organic conversations about how to improve an existing product. As the company and their line grows—Fellow hopes to introduce five new items this year alone—they’ve started working with competitive baristas to perfect their products. “We work from a point of observation and need,” Miller says. “And an understanding of what the baristas who are using our products like and didn’t like about items already on the market.” With these thoughts in mind, Fellow prototypes new designs and, using a 3D printer, are able to get feedback from baristas on fully functional designs. Looking down at the sleek, polished surface of the Stagg EKG—the company’s first electronic product—you can almost see the layers of product testing. The device, a kettle with a PID and to-the-degree temperature control, is attractive—sleekly industrial—but it also works, exceptionally well. The Stagg EKG isn’t an outlier in their line either. Everything in the shop looks like it could sit on a coffee table as a piece of art. In the future, Miller and crew hope to open more Fellow brick-and-mortars in major cities as well as continue to concept and produce products that look great and function better. A Bluetooth-compatible Stagg EKG Plus will arrive soon as well as a host of other coffee-brewing accessories. The Valencia brick-and-mortar, like all their products, is still a work in progress, with local and not-so-local coffee roasters lining up to teach classes to those seeking to better their knowledge of the various aspects of coffee. “Stumptown wants to come in,” Miller says. “Wrecking Ball wants to teach a class about the flavor wheel. Verve wants to do an event with their coffee truck.” For now, they’ll work on improving the consistency of the Playground—providing scheduled daily brewing classes as well as a cupping every Sunday. When you walk past the store that only sells kettles on Valencia, it might do you well not to scoff, but step in, converse, and play around for a bit. If Miller and McPhee have their way, you might actually learn something. Fellow is located at 820 Valencia Street, San Francisco. Visit their official website and follow them on Facebook, Twitter, and Instagram. Noah Sanders (@sandersnoah) is a contributor based in San Francisco. His writing can be found in SF Weekly, Side One Track One, and The Bold Italic. Read more Noah Sanders on Sprudge.